Total darkness surrounded Elaine Grinnell (Jamestown S’Klallam and Lummi) except flickering light showing through cracks in the potbelly stove. The light illuminated her grandfather’s face as he calmly peeled apples and told stories during those World War II blackouts along the Jamestown Beach. Even with barbed wire rolled out on the sandy beach and her mother working at the ammunition depot, Elaine forgot her fears as she absorbed each word. Her grandfather, David Prince, gave her the gift of storytelling. Living with her grandparents, Elaine found they wouldn’t speak to her in Klallam, but her grandfather used some of the vocabulary in his stories. Not only does Elaine do this now, she became a certified Klallam language teacher in 2003. Art and tradition are tightly woven through Elaine’s life and won’t let her retire. She still tells stories several times a week at NatureBridge, an environmental literacy education program based at Olympic National Park. At 81-years-old, Elaine continues to serve on several committees and boards. 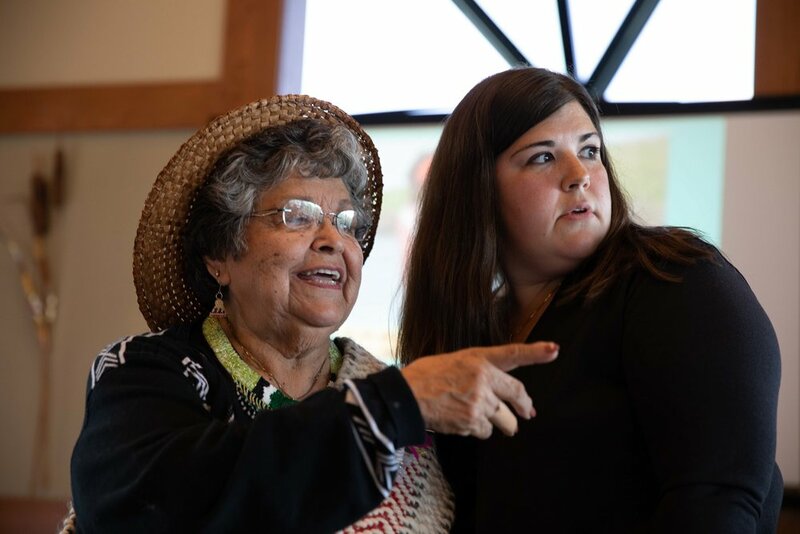 Her steadfast dedication led her granddaughter, Khia Grinnell (Jamestown S’Klallam and Lummi), to nominate Elaine for a First Peoples Fund Jennifer Easton Community Spirit Award. Elaine is one of the Pacific Northwest’s Native cultural and traditional treasures, and we were pleased to recognize her with a 2018 Community Spirit Award (CSA). In June, we visited Sequim, Washington to honor Elaine in her community. Over 100 people gathered at the community center from tribes in Washington, Canada, and Oregon, as well as First Peoples Fund staff from South Dakota. Elaine recently went to Alaska and was able to visit with Marie Meade (Yup’ik), another 2018 CSA recipient. Though storytelling is her predominate art medium these days, Elaine continues teaching three generations in her family cultural foodways and traditional basket weaving. Along with showing her family how to gather, prepare, and weave Western Red Cedar bark, she practices traditional food gathering and cooking. 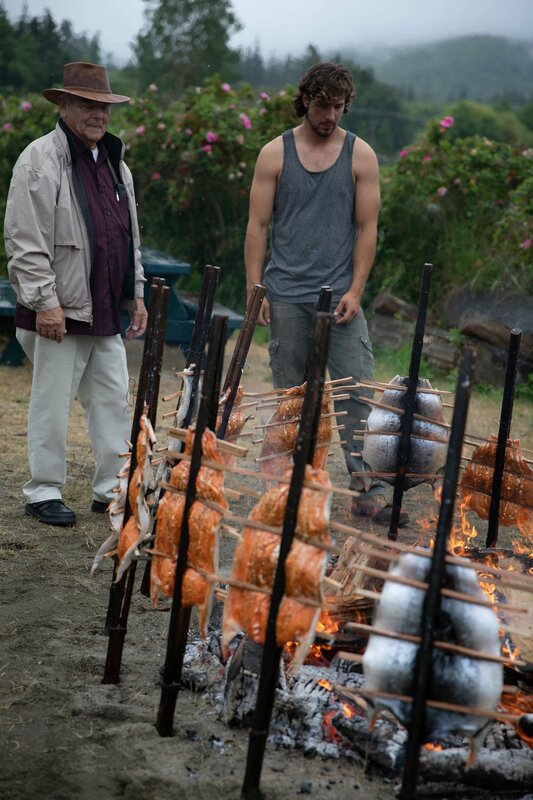 She spent much of her life living on and around the Straights of Juan de Fuca (also known as the Salish Sea) where she dug clams, picked oysters, caught salmon, crab, and octopus and prepared them in traditional ways. Elaine takes her cultural practices worldwide—or down the road to an ailing community member. “This week, I went to visit a lady who has an autoimmune system issue. She was so lonesome for Indian food, so my grandson and I took her clam chowder and fry bread. She just tore into it. That was so fun to see her smile. When Khia was a child, Elaine took her to do storytelling at events. Years later, Khia now tells stories on her own or in tandem with her grandmother. At gatherings, Elaine sometimes brings her baskets, hats, drums, and rattles. She explains how their traditional baskets and hats were used. Using drums and rattles, she brings a heartbeat to her stories and songs. Elaine and Khia serve together on the Northwest Native American Basketweavers Association board. For many years, Elaine emceed the annual gathering and plans to do it for the last time this year. Or so she says. She has already tried to retire three times, but her love of community and culture always calls her back to the work she loves. Elaine began recording her oral stories for preservation and plans to use funds from her Community Spirit Award to finish for a total of 4 volumes. “It scares me to death that I’m going to wake up one day and not remember my stories,” she says. For decades, Elaine has worked for the revitalization, preservation, and perpetuation of her people’s culture.